In 1968 Atkinson redesigned the Mk I cab and created the Mk II version which was six inches wider. It had a two inch lower door line, a completely flat floor, improved interior, lock actuators in place of handbrake to ease access, and dual headlamps. The pedal position was improved, a Chapman suspension seat standardized, and heater output increased. 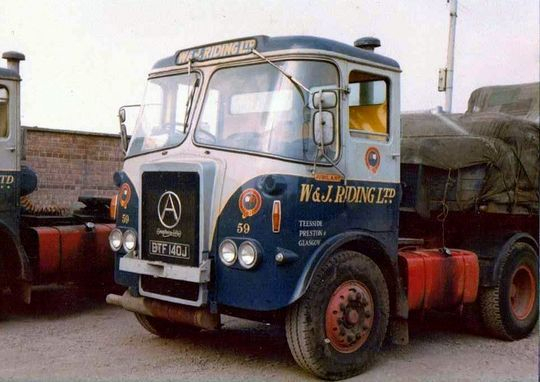 After operating a considerable number of Atkinson Mk I 4x2 tractor unit's from 1963 onwards, it came as no surprise that the company moved on to the newly launched Atkinson Mk II in 1968/9. 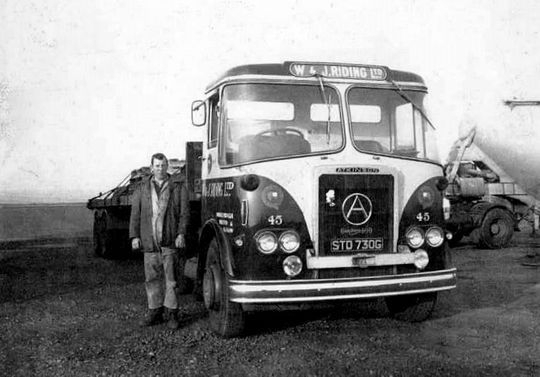 Within twelve months of the first Atkinson Mk II 4x2 tractor units arriving at W & J Riding the entire articulated fleet had been replaced by the Atkinson marque with not a single Leyland tractor unit remaining. Atkinson Mk II Silver Knight 4X2 tractor unit Reg No STB 330G Fleet No 53 'Furious' was registered new on the 1st of July 1969 at a cost of £3,980. STB 330G was one of a pair Mk II's to enter service with Riding's at the time and was allocated to long time serving Riding's driver Ted Bamber. It is seen here having just arrived at Longridge depot after a punishing journey over the Pennines with a 20 ton load of pulp from Hartlepool Docks destined for delivery to Roach Bridge Paper Mills near Preston. After being in service with Riding's for almost nine years STB 330G was sold on to a Mr Bateson of Preston for £2,222 plus vat on the 17th January 1978. 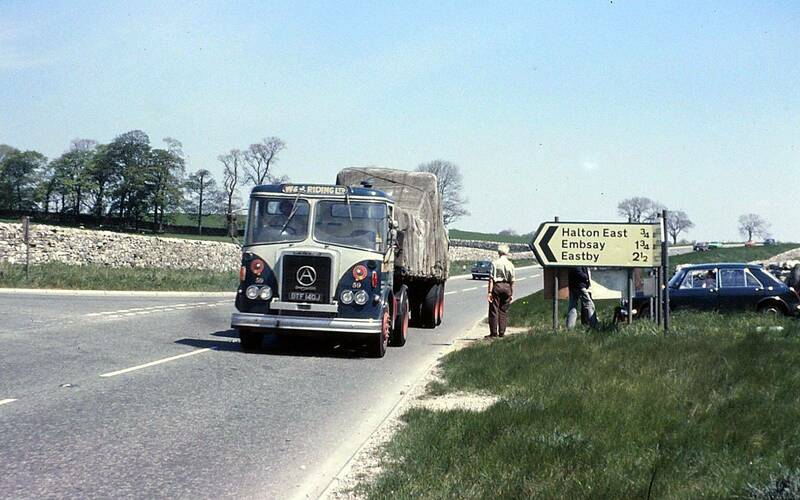 Atkinson Mk II Silver Knight 4X2 tractor unit Reg No STD 730G Fleet No 45 'Zealous' was one of a pair of brand new Atkinson Mk II tractor unit's Riding's put on the road on the 1st of July 1969. Purchased at a cost of £3,976 18s 6d it was powered by a Gardner 180 engine in line with a six speed David Brown gearbox and Kirkstall BDR rear axle. 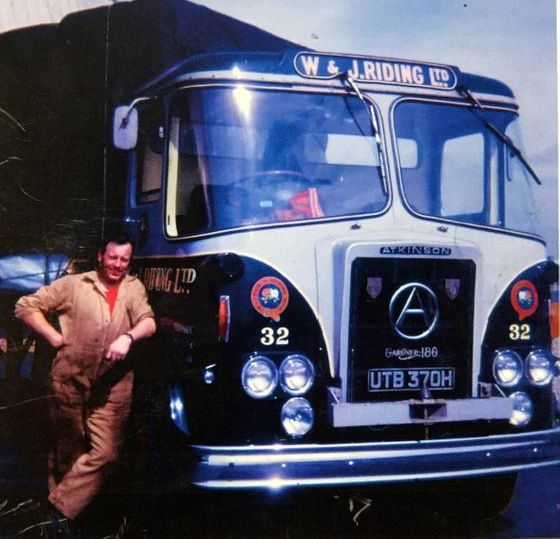 Seen here at Kirtlebridge in Dumfries and Galloway, during a return trip from Scotland, it is pictured with it's first driver a youthful Kenneth Moon who would later spend a total of 41 years driving for the company. 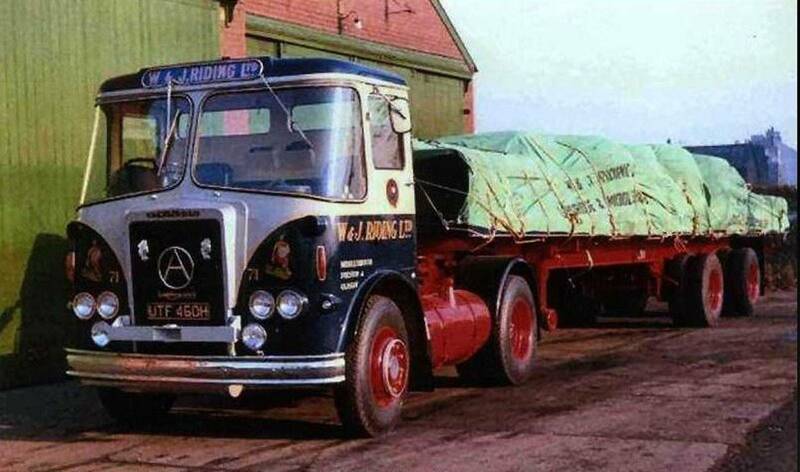 He had collected this particular load from the British Steel Corporation Meadow Works at Motherwell for onward delivery to Garrington's of Bromsgrove in the West Midlands. 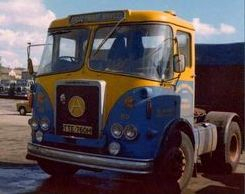 After nine years service STD 730G was eventually sold on in 1978 to a Mr W.R. Taylor of Melling near Liverpool for £2,500 plus vat. 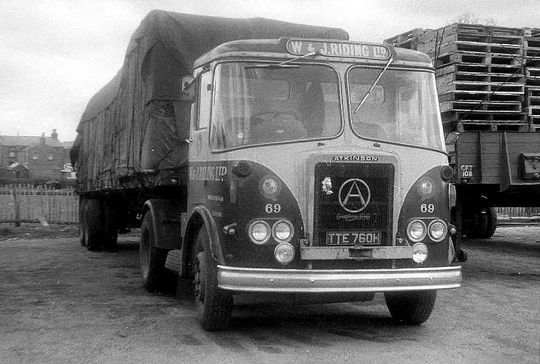 Atkinson Mk II Silver Knight 4X2 tractor unit Reg No TTC 750H Fleet No 68 'Eager' was registered new on the 1st August 1969 at a cost of £3,976 18s 6d. Powered by a Gardner 180 engine in line with a 6 speed David Brown gearbox and Kirkstall BDR rear axle this was the standard Riding spec at that time. The on the road picture above shows it hauling a 33 foot Crane Freuhauf trailer loaded with 20 tons of Heinz products. TTC 750H spent a large part of its life on 24 hour running between Riding's Teeside and Longridge depots transferring trailers. After eight years service in the Riding fleet it was sold on to John Killingbeck of Blackburn on the 22nd of August 1977 for £2,500 plus vat. As with all new vehicles, Riding's specified chrome bottom bumpers along with custom-built secure battery & tool boxes which were chassis mounted. Fuel tanks were also built to Riding specification including modified filler-necks and locking caps. To reduce tare-weight, Riding's modified the top bumpers so that they still afforded protection to the radiator and retained a towing pin. After seven years service on the Darlington trunk change over TTE 760H was withdrawn from the fleet in October 1976. 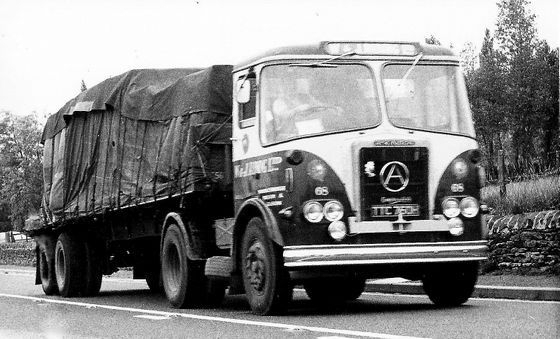 Atkinson Mk II Silver Knight 4X2 tractor unit Reg No XTF 580H No 73 'Olympian' was registered new by Riding's on the 1st June 1970 at a cost of £4,551 62d plus vat. 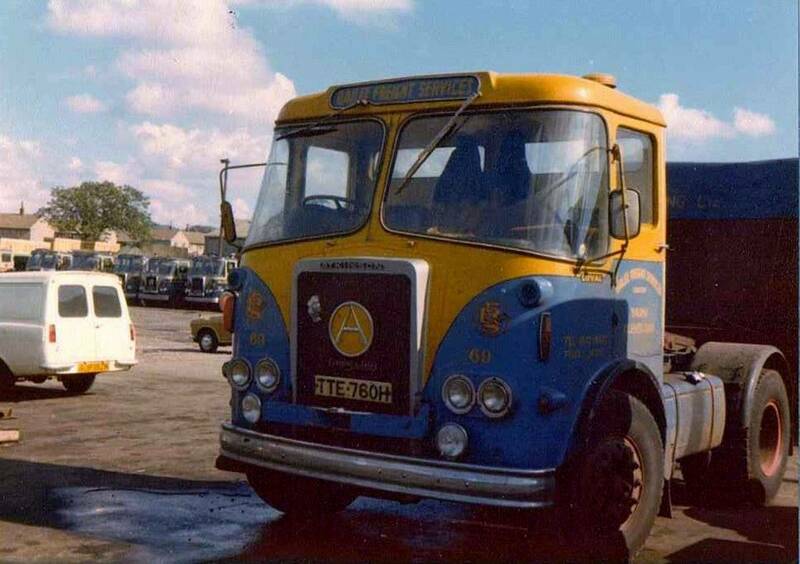 Powered by a Gardner 6LXB 180 engine it is seen here at Fleetwood in the mid 1970's while taking part in the 'Lorry Driver of the Year' event. Another shot of Atkinson Mk II Silver Knight 4X2 tractor unit Reg No XTF 580H No 73 'Olympian' during the annual the 'Lorry Driver of the Year' event. Atkinson Mk II Silver Knight 4X2 tractor unit Reg No XTF 580H Fleet No 73 'Olympian' is seen here being filled with fuel at Daniel Platt Garage, a long time before the fuel island was installed in the middle of the yard. 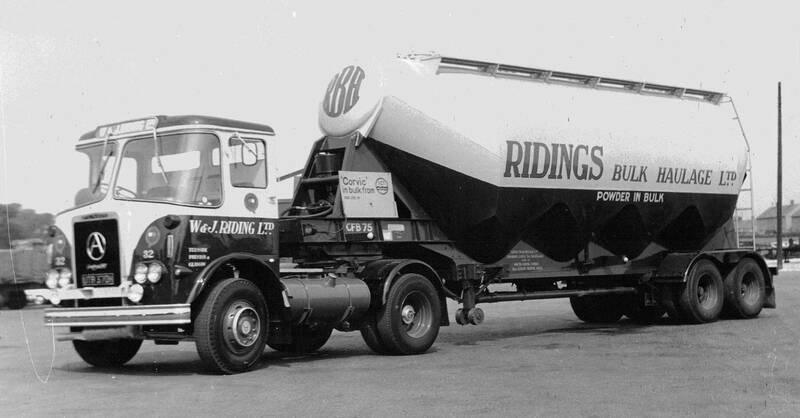 With a 9'6" wheelbase and powered by a Gardner 6LXB 180 engine this was a typical Riding fleet motor of it's day. 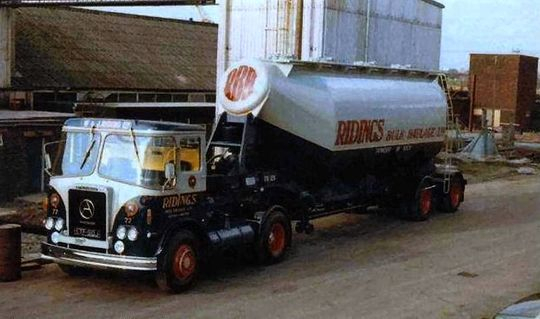 Riding's were still running Albion Super Clydesdale rigids, but the entire articulated fleet was Atkinson by the time this picture was taken with no Leyland's remaining. After eight years service with Riding's XTF 580H was eventually sold to Stanley Hart of Banks Nr Southport on the 1st of July 1978 for £2,400 plus vat. 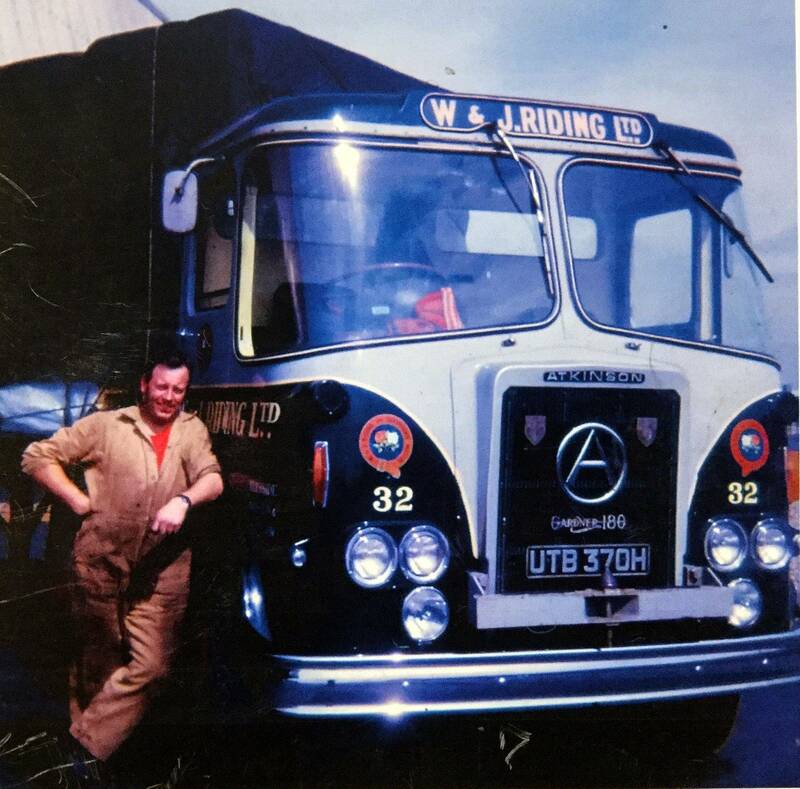 Long time serving Riding's driver the late Jack Moon is pictured here at the age of 33 alongside his brand new Atkinson M II tractor unit in October 1969. In November 2017 Jack sadly passed away at the age of 81 after a long battle with cancer. 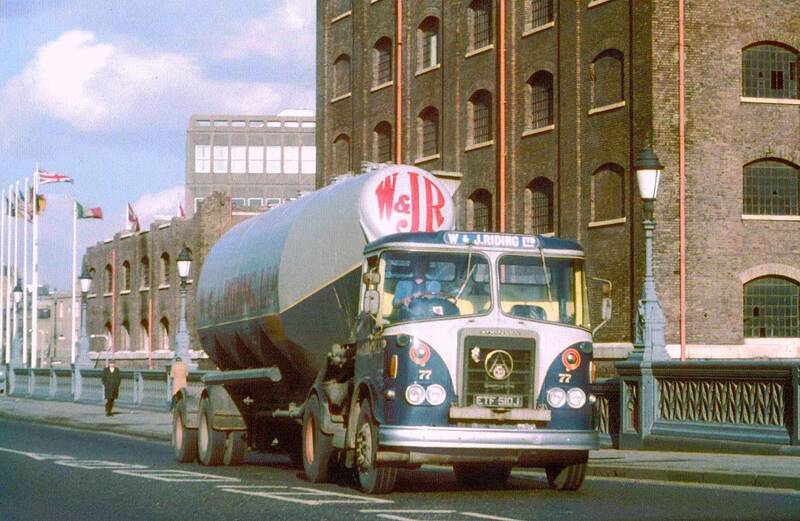 The Atkinson Mk II 4x2 tractor unit in the picture above is Reg No UTB 370H Fleet No 32 'Illustrious'. Powered by Gardner 6LXB 180 engine it was registered new to Riding's on the 1st of October 1969 at a cost £3,976 plus vat but just two months after entering service it was involved in a serious accident in Scotland in which driver Jack Moon was in no way responsible. After the accident UTB 370H was completely rebuilt and served Riding's for many more years as can be seen in the two pictures below. 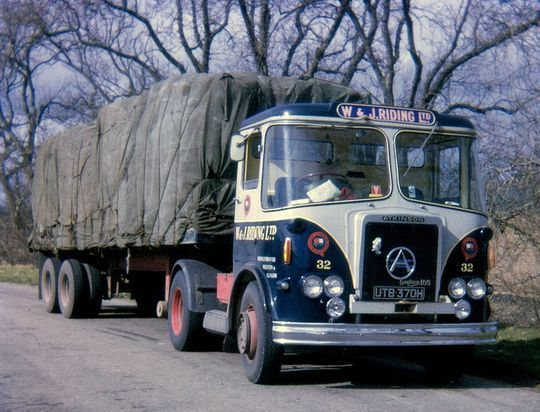 Atkinson Mk II 4x2 tractor unit Reg No UTB 370H Fleet No 32 'Illustrious', powered by Gardner 6LXB 180 engine, was registered new to Riding's on the 1st of October 1969 at a cost £3,976 plus vat. Having been previously involved in a very serious accident on the A75 near Dumfries, for which Riding's long serving driver Jack Moon was in no way responsible, the vehicle was taken into Riding's workshops and rebuilt. 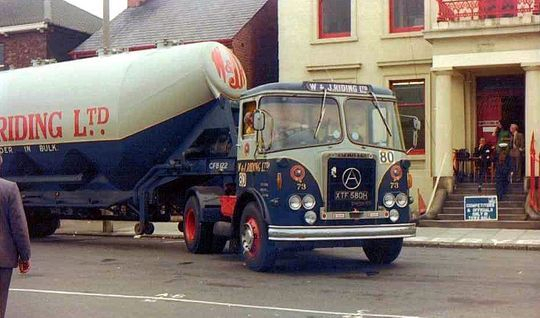 The photograph above was taken shortly after the complete rebuild and shows the tractor unit posing with a powder tanker which it never actually pulled as this vehicle was used on general haulage work. 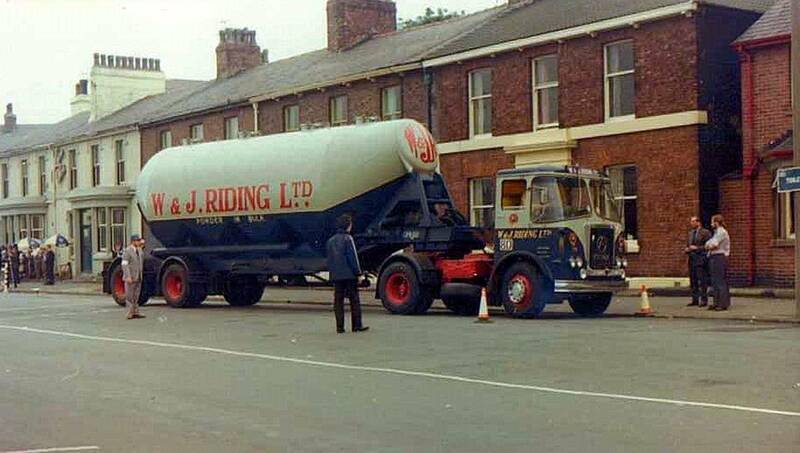 After being in service with Riding's for over eight years UTB 370H was sold to J & J Rimmer of Southport on the 3rd of March 1978 for £2,350 plus vat. 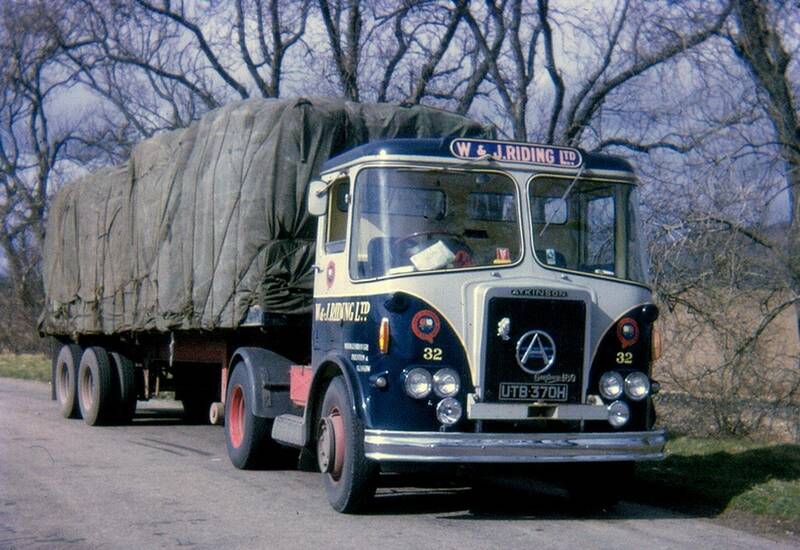 Another shot of Gardner 180 powered Atkinson Mk II 4x2 tractor unit Reg No UTB 370H Fleet No 32 'Illustrious'. Seen in the previous picture while coupled to a powder tanker it is seen here more at home assigned to the general haulage fleet with a loaded forty foot flat trailer. 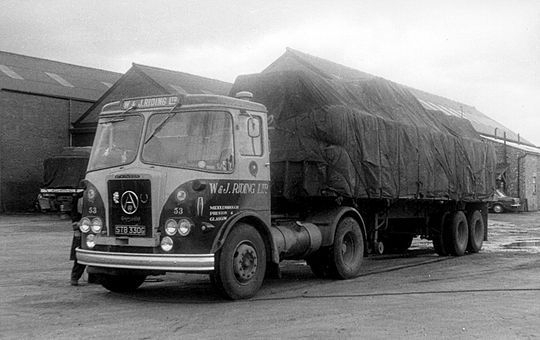 Atkinson Mk II 4x2 tractor unit Reg No UTF 460H Fleet No 71 'Steadfast', driven regularly by the late Keith Gornall, was fitted with a long range 90 gallon fuel tank along with a 5.78:1 ratio axle which gave it more speed. Registered new to Riding's on the 1st of December 1969, at a cost of £4,287 5d plus vat, it is pictured here when brand new while coupled up to a wide spread tandem axle 40 foot trailer which was one of six trailers of this type introduced into the fleet at that time. Dirver Keith Gornall later left Riding's and went on to operate his own business just down the road running several ultra smart Streamline V8 Scania's and Volvo F16' tractor unit's transporting abnormal steel loads. Atkinson Mk II 4X2 tractor unit Reg No XTD 800H Fleet No 72 'Gallant' was powered by a Gardner 180 engine in line with a David Brown gearbox and Kirkstall axles. Registered new on the 1st May 1970, at a cost of £4,537 17s 5d, it was driven from new by Alan Hall and ran mainly coupled up to tanker No CFB 122, seen in the picture. was converted to a tri-axle bogie to take advantage of the increased 38 ton GVW, obviously with a different tractor unit. The picture above shows it heading down Archway Road London on Thursday the 15th February 1973 by which time it would have been on its third weekly round trip between Hillhouse and Ashford which explains why it is in a filthy condition due to salt from the roads. After eight years service XTD 800H was eventually sold on to Tom Riding's brother in law L.J. Ball of Dutton Longridge on the 31st of March 1978 for £2,600 plus vat which, after eight years continued use, was not a bad investment? 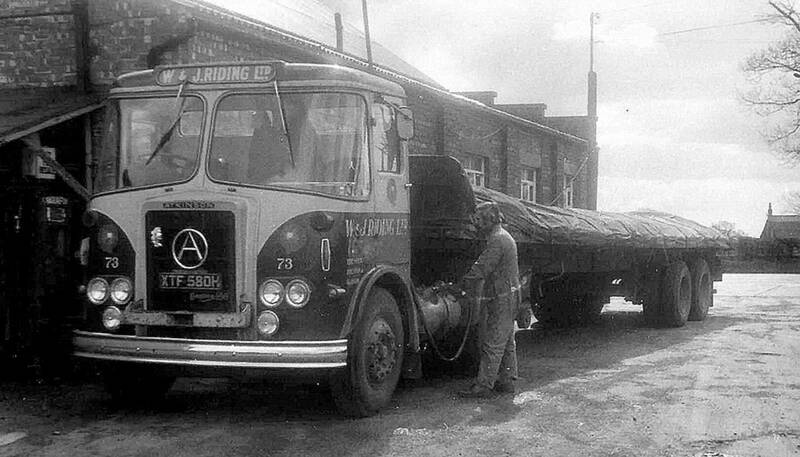 Atkinson Mk II Silver Knight 4X2 tractor unit Reg No CTD 450J Fleet No 76 'Skillful' is seen here in a very workman-like pose, while having a bath in the depot at Longridge. The ravages of time have seen the end of the chrome front bumper at this point in its life. 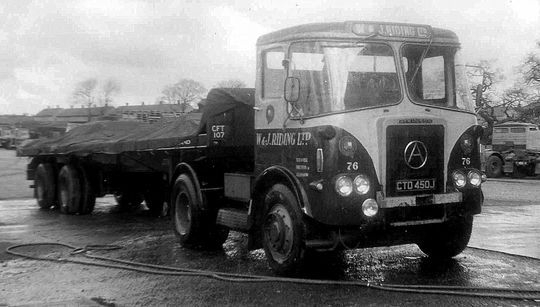 Atkinson Mk II Silver Knight 4X2 tractor unit Reg No BTF 140J Fleet No 59 'Jubilant', powered by a Gardner 180 engine, was registered new by Riding's on the 1st of November 1970 at a cost of £4598 7s 6d. Baring Chassis No FC 19078 BTF 140J had the standard specification at the time which was a Gardner 180 engine in line with a David Brown 6 speed gearbox and Kirkstall BDR axle.. Driven from new by the late David Roberts, who is pictured at the wheel, it is seen here in 1971 while heading West on the A59 near Skipton in North Yorkshire. After 8 years hard work in the Riding fleet it was sold to John Killingbeck of Blackburn in November 1978 for the sum of £2,500 plus vat. 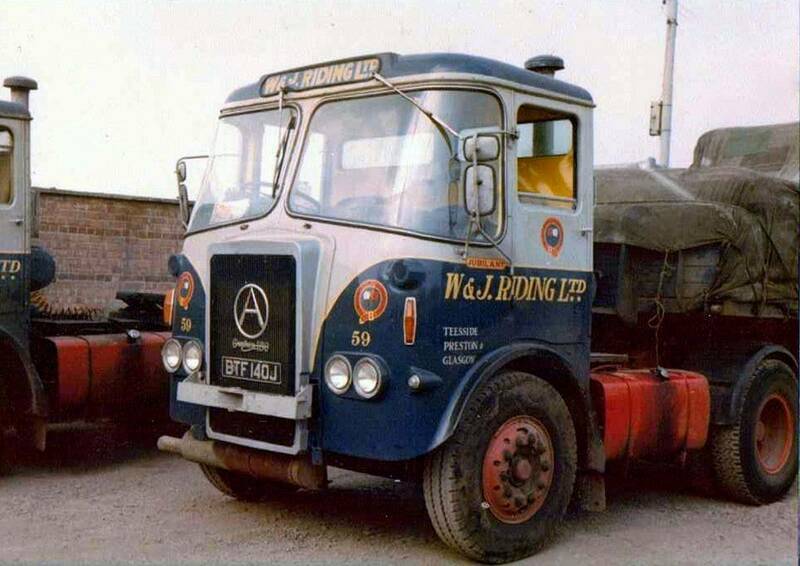 Atkinson Mk II Silver Knight 4X2 tractor unit Reg No BTF 140J Fleet No 59 'Jubilant is seen here in later life looking a little worse for wear minus it's chrome bumper. 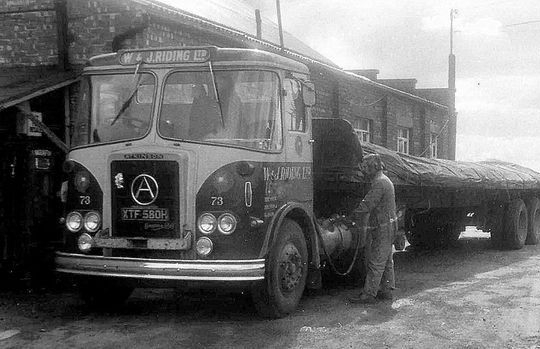 Atkinson Mk II 4x2 tractor unit Reg No ETF 510J Fleet No 77 'Active' was powered by a Gardner 6LXB 180 engine in line with a David Brown six speed gearbox and Kirkstall axle. Registered new to Riding's on the 5th of May 1971 at a cost of £4,872 plus vat it was driven on a regular basis by the late Fred Wolstenholme, aka Pluto. It is seen here when new at the premises of Hepworth Polva Plastics in Padiam near Burnley a company which manufactured plastic piping and guttering..
After seven years service with W & J Riding ETF 510J was sold on the 14th of August 1978 to John Killingbeck of Blackburn for £2,500 plus vat. It is pictured here in 1979 near Ross on Wye. 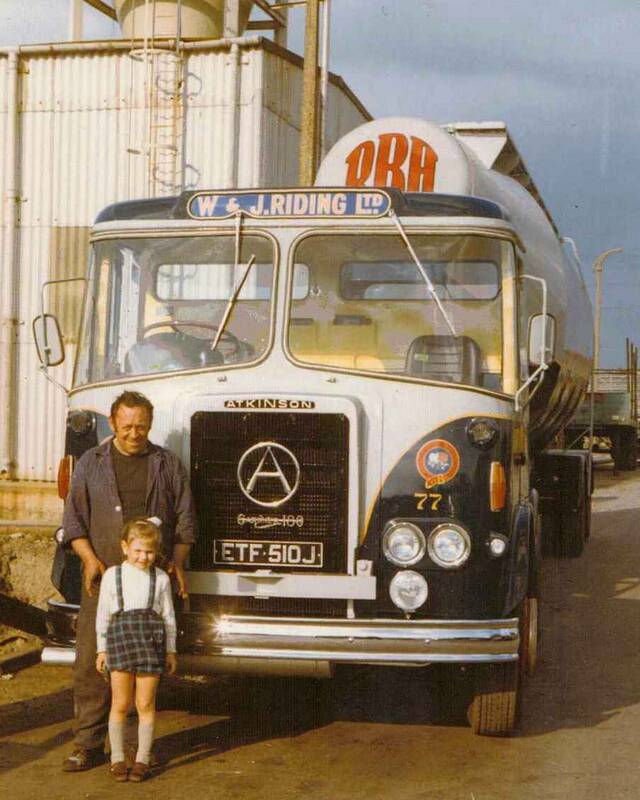 The late Freddie Wolstenholme takes time out for a picture with Tom Ridings eldest daughter Elizabeth in front of Atkinson Mk II 4x2 tractor unit Reg No ETF 510J Fleet No 77 'Active' one Sunday morning at Padiham. Unfortunately Freddie Wolstenholme was tragically killed in a road traffic accident four years later. Another shot of Atkinson Mk II 4x2 tractor unit Reg No ETF 510J Fleet No 77 'Active'. Registered new on the 5th of May 1971 it is seen here steadily making it's way South towards Tower Bridge while hauling one of Riding's powder tankers. It would have been destined for Ashford in the days when it was the norm to go through London long before the building of the M25 orbital ring road.